Hubble Space Telescope. Image courtesy of Tiantian Yuan. By exploiting a lucky accident, astronomers have for the first time measured a key property of a spiral galaxy located more than 9 billion light-years away. The observations show that oxygen and iron abound at the center of the galaxy but not at its edge, which suggests spiral galaxies--including Andromeda and our own Milky Way--formed their giant disks of stars from the inside out. Spanning 120,000 light-years, our Galaxy's disk outshines the rest of the Milky Way. The disk harbors the Sun and most of the Galaxy's other stars, as well as the beautiful spiral arms. But exactly how the disk formed is unknown. One clue comes from the metallicity of the disk’s constituent stars. Metallicity is a measure of the relative abundance of elements other than hydrogen and helium. Stars create these elements and spew them into space. Because stars congregate at a galaxy's center, the metallicity in most nearby spirals is greatest there and drops toward the edge. In the Milky Way's disk, for example, travel 10,000 light-years outward and the metallicity falls 35 percent. Different theories predict how this metallicity gradient changes over billions of years. Some theories predict it starts steep and later flattens; other theories predict just the opposite. If astronomers could observe metallicity gradients in spiral galaxies billions of light-years away, we could see how steep the gradients were billions of years ago and thus how they change over time. Unfortunately, such distant spirals look so small and faint that no one has ever done so--until now. 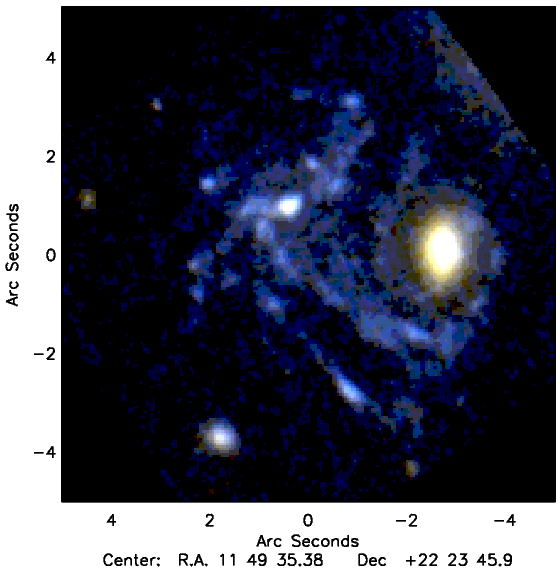 Tiantian Yuan and Lisa Kewley of the University of Hawaii in Honolulu and their colleagues at Durham University in the UK observed a spiral galaxy in the constellation Leo with a redshift of 1.49. This means that the universe's expansion has stretched the galaxy's light waves by 149 percent as they travelled to Earth. Such a high redshift indicates the galaxy is 9.3 billion light-years away, so we see it just 4.4 billion years after the big bang. "This galaxy is just beautiful," says Yuan. "Normally, galaxies at that redshift appear as blobs." The galaxy looks so good because it lies behind a galaxy cluster. Named MACS J1149.5+2223, the cluster is massive and its gravity magnifies the distant galaxy. As a result, the galaxy appears 22 times brighter than it otherwise would be. Yuan and colleagues used the giant Keck II telescope atop Mauna Kea in Hawaii to measure the galaxy's metallicity at several different points. "The galaxy has a very, very steep metallicity gradient," she says. Travel 10,000 light-years outward in the galaxy's disk and the metallicity plummets 68 percent. Because we see the galaxy when it was young, this result suggests spiral disks start off with steep metallicity gradients. "It's a fascinating piece of work," says Andrew Benson, an astronomer at the California Institute of Technology in Pasadena who was not connected with the new study. "It's sort of pioneering in many ways, because doing this kind of detailed study of a galaxy at a very high redshift is extremely difficult." Benson says that the steep metallicity gradient agrees with the long-standing but unconfirmed idea that spiral galaxies form their disks of stars from the inside out. In this model, a mass of gas collapses and creates lots of stars at the disk's center, where the stars quickly boost the metallicity. However, because few stars form on the disk's outskirts, the metallicity there stays low. Thus, the disk begins its existence with a steep metallicity gradient, like the one in the distant galaxy in Leo. Then, over billions of years, stars develop in the outer regions, raising the metallicity there and flattening the gradient. Yuan acknowledges one weakness: this is just one galaxy. "It looks like a pretty normal galaxy," she says. "From this point of view, we think it could be very representative." In addition, last year other astronomers reported a steep metallicity gradient in an even farther galaxy, but that galaxy is not a spiral, so its relevance to the Milky Way is less clear. The next step for the astronomers is to study additional spiral galaxies at great distances. Says Yuan, "In fact, I'm going to observe another one this week." Yuan and her collaborators describe their work in The Astrophysical Journal. Ken Croswell is an astronomer and author of eight astronomy books, including The Lives of Stars.